Re: Why are posters concluding that the CTSMC is not responsible for fixing Lobato? Chris -- Maybe I can help. The basic answer to your question lies in the very nature of the "Management Agreement" between the Commission as owner of the C&TS and CTSMC as the outfit providing management services. That agreement is a public document and can be obtained from the Commission. I'm sure there are various other kinds of agreements between owners and operators of railroads, but one needs to examine the terms of the contract itself to see to what the parties (the Commission and CTSMC) agreed. The agreement itself is rather lengthy, but it essentially authorizes CTSMC to manage and operate the railroad in accordance with mutually agreed budgets and lots of other provisions regarding the responsibilities of each party. For instance the Commission agrees to obtain and maintain liability and fire and property damage insurance on all of the C&TS assets and operations, essentially because the Commission is the owner, and to include CTSMC as a "name insured." That gives one a pretty good idea of how liability for the fire would be handled. The contract lists 26 duties, obligations, and responsibilities that CTSMC agrees to satisfy on a "best efforts" basis. None of these provisions spell out any affirmative obligation by CTSMC that would cover this incident, other than CTSMC agreeing to comply with FRA rules (but find out for yourself). One interesting aspect of the agreement is that the Commission has control of all the finances -- e.g., ticket revenues go to the Commission, and the Commission reimburses CTSMC for all expenses (subject to budgetary controls). In turn CTSMC gets paid $7,500 a month to carry out those duties. There are also some incentive bonuses which, if met, the Commission pays to CTSMC, and which CTSMC in the past has distributed to employees. The Commission can also contract with CTSMC for capital projects, such as the trackwork upgrades and locomotive rebuilding, but these are subject to separate project-specific agreements. Now, as to the question of any liability for the fire. CTSMC does agree to indemnify the Commission for any acts or omissions by CTSMC and its employees, but all that really says is that if CTSMC screws up, it agrees to indemnify the Commission from any suit for damages brought by some other party. 1. As others have commented, it's very likely that the fire was ignited by an ember from a locomotive heading toward Chama. 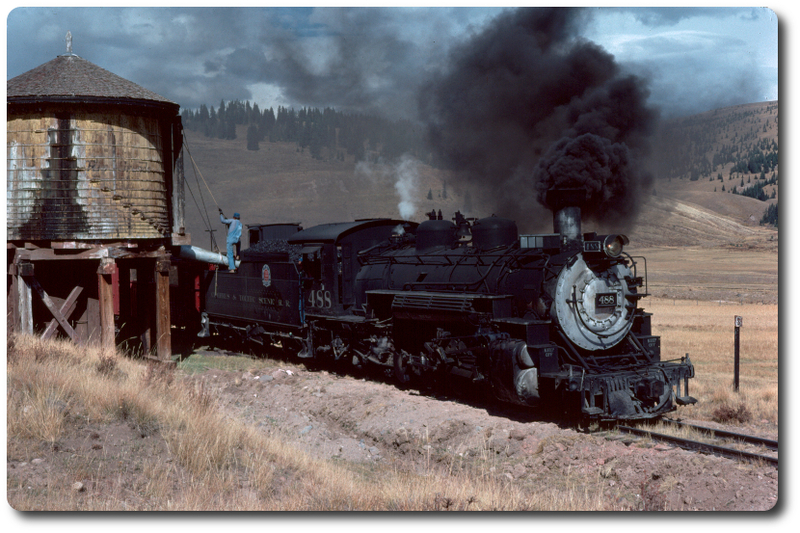 The experience over the years has been that ascending (not descending) locos throw out hot cinders and CTSMC always has a water-tank speeder following upbound trains. Little "frying-pan" sized fires do occur periodically going up the mountain, but not down. Over the life of the C&TS neither Lobato nor Cascade have ever caught fire (maybe never in the 128-year history of the bridges. So, pretty tough to make a case that some sort of negligence was involved, especially since no one has yet established the actual cause of the fire. 2. Everyone knowledgeable about the fire and fire-fighting techniques has said that having the big fire truck available would not have helped due to the nature and circumstances of the fire. So, even here its arguable as to whether "Adequate fire protection measures were not in place." As a further complication, the facts are that the truck's motor was destroyed last fall (maybe Elmer didn't check the dip-stick) and was residing away from the railroad's premises at Soni's shop. Learning of its condition CTSMC earlier in the day of the fire requested funds at the Commission meeting to fix it. That's the way things have to be done under the agreement. 3. As for Chris's third point that, given CTSMC's "expertise" it should "gets stuck holding the bag when a preventable accident or incident happened under their watch", one needs to demonstrate that the fire was "preventable". Given the history of the absence of any fires on either Lobato or Cascade trestle that's a tough case to make, especially when there is nothing in the agreement between the Commission and CTSMC that places such an obligation on anyone. The Commission could just as easily be faulted by the two states for not having foreseen such a contingency, after all the Commission is the owner. Again, my advice is that one should obtain a copy of the agreement from the Commission and reach own's own conclusions. All I've tried to do is objectively outline the facts as best I understand them. I'm as disheartened as anyone about what has happened, but all I can do is say that the agreement is what it is, and not something else. Why are posters concluding that the CTSMC is not responsible for fixing Lobato?